400 rioters near Ramallah clash with security forces, throw stones and firebombs. Undercover officers break up riot. Undercover Border Police officers broke up a riot of hundreds of Arabs on the outskirts of Ramallah in Judea and Samaria Wednesday. Approximately 400 rioters burned tires and threw Molotov cocktails and stones at security forces during the disturbance. Undercover Border Police officers broke up the riot and arrested three rioters. The officers dressed as Arabs and hid among the rioters in order to break up the riot and carry out the arrest. One of the undercover officers threw a smoke grenade, causing many of the rioters to flee. The IDF was then able to disperse the rest of the rioters. One of the rioters was arrested immediately after throwing a firebomb. 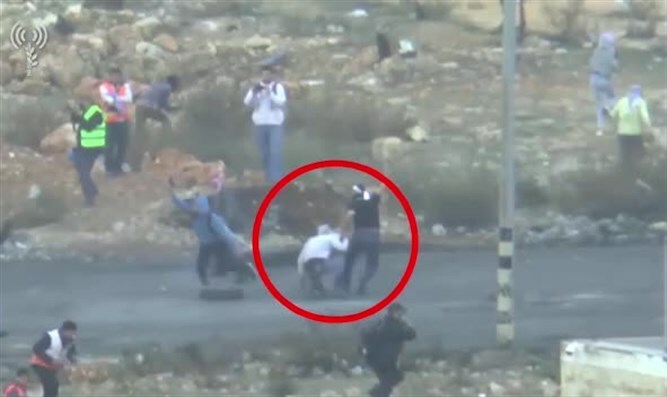 When the three were arrested, another Arab threw a stone at the security forces. The officers responded fired at his lower body. An IDF Spokesperson stated that "the IDF and the security forces will continue to act in order to prevent terrorism, to maintain security in the area and to thwart key terrorist elements." Arab riots and protests have occurred across Judea and Samaria since US President Donald Trump's decision to recognize Jerusalem as the capital of Israel last week.